In this article, we have collected 11 new best Responsive websites themes of 20th October 2014. This themes are well-designed and have lots of great features. Venas is the ultimate Prestashop theme and its extremely customizable, easy to use and fully responsive. This theme is perfect for any type of store. It has hundreds of customization possibilities giving you total control over your store. Great as a starting point for your custom projects. Akal is clean , creative and powerful multipurpose WordPress theme with incredibly flexibility with lots of options and variation. Akal has included multiple header layouts , parallax slider , posts slider , revolution slider , powerful admin panel 600+ google font with support to upload your own fonts , also with easy font integration from premium font vendor websites . All In One is a multipurpose, sophisticated, clean, professional design, high quality code retina ready Premium Joomla Template perfectly suited for any business websites, e-shops, portfolios, corporate, blogs, marketing or technology website (includes one page parallax layout), photo, services and others. 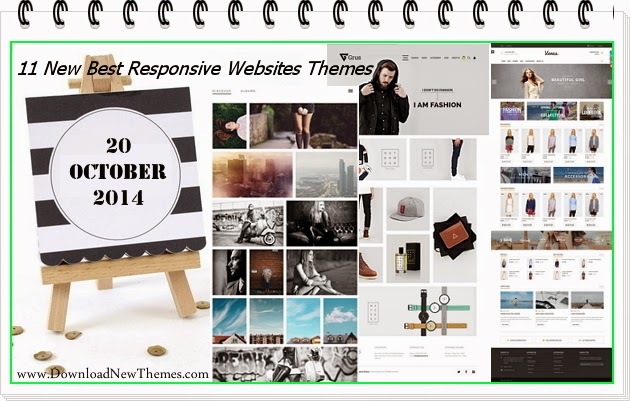 Item Reviewed: 11 New Best Responsive Websites Themes (20th Oct 2014) 9 out of 10 based on 10 ratings. 9 user reviews.